As a Hartford CT Wedding Photographer, I typically take photos of the bride and groom preparing for their big day with their bridal party. The moments that the couple spends with the bridesmaids and groomsmen before the celebrations begin are endearing to witness, especially in the case of the time the bride has with her maids. The groom typically has a pretty easy morning ahead of him in regards to preparing on the day of the wedding. He and his groomsmen usually will do some sort of casual activity together, then they will gather in one place to put on their suits and take a few pictures with their Hartford CT Wedding Photographer. For the bride and bridesmaids, the morning is scheduled down to the minute and is filled with preparations to make the ladies look and feel their very best. Pictures taken from this portion of the day document the transformation that takes place, from a girl and her friends dreaming about wedding bells, to bridesmaids and a bride, who is ready to become a wife. 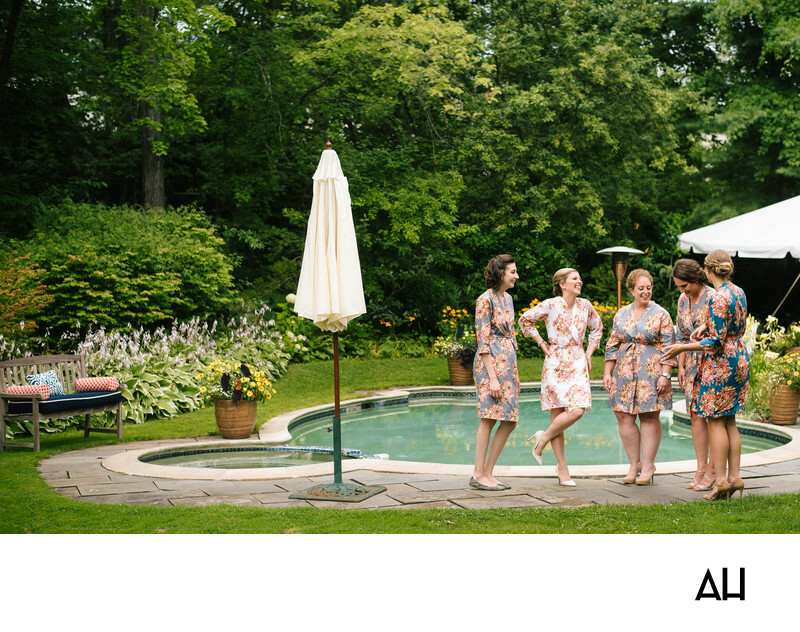 The bride pictured above stands in a backyard area with her closest friends. The ladies have finished getting their hair and makeup done and now only need to slip into their gowns. For now, the girls wear their heels and flowered robes. This is so that they would not ruin their dresses during the hair and makeup process, but will be able to easily change without messing up any of the work done by the makeup artist and hair stylist. The bride is radiant in a white robe designed with delicate pink flowers. She laughs as one of her friends shares a story of something that happened as they were getting ready in the course of the morning. The ladies are able to breathe a little for this moment, and simply enjoy one another’s company. In a few minutes they will go inside to help the bride into her wedding gown. From there the day will be filled only with celebration. As a Hartford CT wedding photographer there are a wide choice of wedding venues including Residence Inn Downtown Hartford, Radisson Hotel Hartford, Hot Tomatos, Christ Church Cathedral, Charter Oak Cultural Center, Faith Congregational Church, Infinity Music Hall & Bistro, Arch Street Tavern, XFINITY Theatre, and Sidewalk Cafe.